This past Saturday was Batman Day, so naturally projects featuring the Caped Crusader saw the chance for a little corporate syner... er... celebration. 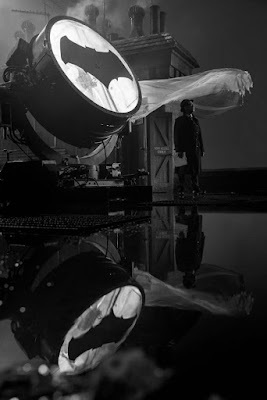 Among them was Justice League, which opted to premiere the first proper look at J.K. Simmons' Commissioner Gordon via director Zack Snyder's Twitter account. It's not exactly the clearest look at Gordon, but at least he's in a familiar place, lighting the Bat Signal. Simmons has said that Gordon won't have a massive amount of screen time in the film, but given the actor's usual abilities, we expect he'll make the most of it. Justice League finds Ben Affleck's Bruce Wayne and Gal Gadot's Diana Prince trying to gather the other superheroes they've discovered so far, including Ezra Miller's Barry Allen/The Flash, Jason Momoa's Arthur Curry/Aquaman and Ray Fisher's Victor Stone/Cyborg. They'll need the help, as a dangerous threat is on its way, and we don't yet know when and how Henry Cavill's Superman will (spoiler alert) return from the "dead".